On Saturday May 13th, Vanguard America sent some of its best to stand alongside Identity Evropa, League of the South, and the Traditionalist Worker Party to protest the proposed removal of a statue of General Lee in Charlottesville, Virginia. The purpose of the gathering was not simply over some metal sculpture atop a pedestal in a small Southern City. It was about defending the images of White history, White heroes, and White America. The Jews and their liberal shabbos goyim, in a feverish haste and hubris, have decided to prematurely declare themselves the winner of their War of Attrition against the White man by tearing down our monuments. Just as the Christ-Killers vandalized statues and temples during Rome’s fall (hence why most ancient busts lack noses), they now seek to blaspheme our history and heritage to spiritually drain White America. The event was a smashing success. Writers at the (((Huffington Post))) and the (((Daily Progress))) were “literally shaking” as they furiously wrote their hit-pieces on the event. Their articles lamented the imminent Confederate Nazi takeover of the United States, yet simultaneously slandered the crowd of fit and disciplined White men and women as being perma-virgin basement dwellers. Their mistake, of course, was that said basement dwellers were actually busy making an appearance at the embarrassing Boston “free speech rally”. Many local “conservative” politicians soon engaged in a competition of who could cuck the fastest and hardest, revealing their true nature as controlled opposition for the ZOG machine, with the notable exception of current gubernatorial candidate Corey Stewart. The Mayor of Charlottesville took the event as a go-ahead to denounce White interests and White identity, promising to erect statues commemorating lynching and other such morbid acts to prop up the Jewish Cult of Death that has gripped our Nation’s popular culture for the last century. The day was practically ours from the start. After a breakfast a Chik-Fil-A, the last stand of implicit whiteness and anti-homo propaganda, the group met at one of the local parks to get into formation. Before long, a few washed-up spinsters babysitting brown children at the playground approached us, armed with their smart phones to take video and pester the group, hoping to send “evidence” to their Jewish masters for doxxing purposes. Their attempt to bother us amounted to nil as we soon unfurled our flags and embarked on our glorious march through the city. As we approached Lee Park, we passed a wedding ceremony for a beautiful White couple and wished for them to have many healthy offspring. As we gathered at the park, Richard Spencer, Sam Dickson, Nathan Damigo, and Mike Enoch delivered high-energy speeches to the crowd. Riled up with the spirits of our ancestors within us, we chanted in perfect unison: “You Will Not Replace Us!”. The sound rang throughout the entire city. The BLM crowd eventually took notice as we dispersed, and confronted us with a pathetic showing of attempted resistance to inevitable victory of Global White Supremacy™. (For video of this portion, click here). As we left the rally to prepare for the next phase of events, many young Jewish college students left the multicultural (anti-White) festival at another nearby park to follow us down the street ranting and raving. As usual, these groups wait until the rally is over and then follow people as they leave so they can say that they “drove us out”. They genuinely think that they chased us away, because the only form of protest they understand is the “occupy” technique of loitering for hours smoking weed and playing terrible drum music; inconveniencing local businessmen is apparently the highest form of resistance for them. For Antifa, it is incomprehensible that we could show up for a rally, say our peace, and leave having delivered a powerful and coherent message. These worthless commies, feeling petered-out from having to walk almost half a mile, resorted to singing “Shoo fly, don’t bother me / Say no to white supremacy” to the tune of a nursery song. Truthfully speaking, that was the most painful experience of the day for me. The banquet went by without a hitch and our speakers once again gave inspiring lectures about the movement’s future. Finally, the greatest spectacle of the event came as we lit our torches for the night march. As we approached Lee Park for the last time, our footsteps shook the whole city. Torchlit vigils and other silent rituals are an important part of our heritage to remember the dead and heal the Spiritual Sickness that has plagued our people for so long. Indeed, this Spiritual Sickness is the root of all our problems. Even if we were to expel every Jew and non-White in this country tomorrow, we would still be a nation of depressed, addicted, degenerate, and deracinated people. This movement must begin as a spiritual movement. That does not mean we must choose to be Orthodox, Catholic or Pagan; it means that we must build a new society, culture, and identity based on beauty, aesthetics, rituals, health, history, and nature. We must create our own rituals, our own art, our own music. We must create a culture of life that the channels the spirits of those past to guide us as we carve out our future. We must solve our own people’s problems before we can truly face our enemies. To quote a wise /pol/lak, “If you want to gas the Jews, you must first gas the Jew within yourself”. After a few words from Spencer and Dickson, we blew out our torches, our spiritual cups filled for perhaps the first time in all of our lives and once again shouted our deafening chants, shaking the entire city with our might. There will be many more of these events. This march on Charlottesville was just the beginning of the inevitable Revolution of our people. My impression is that many in the “Alt-Right” feel that the U.S. has been sold out by “conservatives.” Since most of the former are Millennials, they don’t recognize that they have been sold out by people who CLAIM to be conservatives, but in fact never were. The Bush Family is a perfect example of this, and so are 75% of the Republican Caucus in the U.S. Senate. After Ronald Reagan, it was almost impossible for any Republican to get elected to public office — outside of the People’s Republics of NY, MA, CA, HI, and RI — who didn’t at least claim to be “conservative.” Many were liars who misrepresented themselves, but most voters were unwilling to do the hard work of looking at voting records, particularly those available from the American Conservative Union. 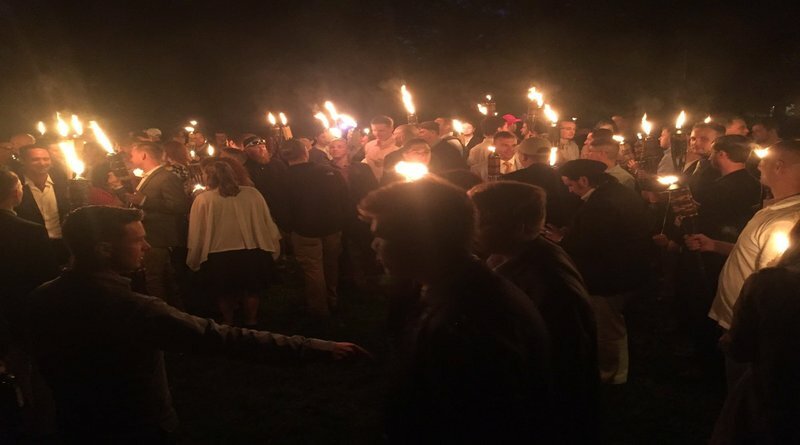 The “Alt-Right” does not differ in their political philosophy from true conservatives in any manner that I am aware: It is, however, younger than most in the conservative movement. Being younger and being Millennials, they tend to assume that history began the day they were born. What they fail to recognize is that were it not for the conservative “pathfinders” who came before them, they would have a following about the size of the Flat Earth Society.